Some consolidation in the world of e-commerce site aggregation and marketing. Connexity, the price comparison shopping and marketing technology company that rebranded from Shopzilla earlier this year, has acquired Become.com. The announcement had been made internally as well as to partners, but Connexity did not plan to make the deal public until the new year, after the holiday shopping season. We got passed a copy of the memo announcing the news, which we are embedding below. Terms of the deal have not been disclosed but we are trying to find out. “Connexity, Inc. confirms it has entered into an agreement to acquire Become, Inc and expects the transaction to close before the end of the year,” the company tells us in a statement confirming the news more directly. We have heard separately that the company is preparing for an IPO under the new Connexity name, although the company says this is not the case. “We are not presently working on an IPO and no plans for one in the near future,” a spokesperson said. Become.com and Shopzilla/Connexity are part of the wave of price-comparison online shopping aggregators that sprung up in the earlier days of the web, before Google got a grip on offering the same kinds of services through their main search engine, and sites like eBay and Amazon were less ubiquitous than they are today as aggregating marketplaces in their own rights. They, and their founders, all reached dizzying heights before crashing down to earth again. Become.com is one of the older e-commerce aggregators out there. It was founded in 2004 and had raised $37.2 million in funding from a list of well-known investors including Rob Conway and SV Angel, TPG, and the European Founders Fund (one of the Samwer brothers’ investment firms). It was also backed by its founder Michael Yang, who had previously started and sold mySimon (another price comparison site) to CNET for $700 million (you read that right: $700 million). Connexity, when it was still called Shopzilla, is even more of a legacy dot-com play. It was originally founded in 1996 and raised just under $75 million. It was then sold to E.W. Scripps for $525 million in cash in 2005 as a play for the publisher to grow its online advertising business. But things didn’t pan out as Scripps had hoped — partly because Shopzilla needed to pay more and more to Google to attract visitors to its aggregation pages; and partly because people simply were shopping online differently than how they used to. So in 2011, the site was sold again, but this time going for only $165 million to Symphony Technology Group, a private equity firm. STG has been slowly rebuilding the company since then. The main idea behind the Become.com acquisition is to extend the reach of Connexity’s shopping network to cover more eyeballs, and net in more traffic from e-commerce sites. The key with aggregation — where revenues are collected on how much traffic you refer to other sites — is scale. Prior to adding Become.com, the company’s price/shopping aggregation sites included Bizrate, Beso, Shopzilla, Retrevo, TaDa, PrixMoinsCher, and SparDeinGeld. Become.com’s footprint is complementary to that of Connexity’s. It aggregates traffic from online retailers and publishers in the U.S., Germany, U.K., France, Italy and Japan. Its business is split roughly 50% Europe, 25% U.S., 25% Japan, Paul Martecchini, VP of marketing for Connexity, said in the statement confirming the deal. While a lot of that build up existing traffic, Japan will be a completely new market for Connexity. 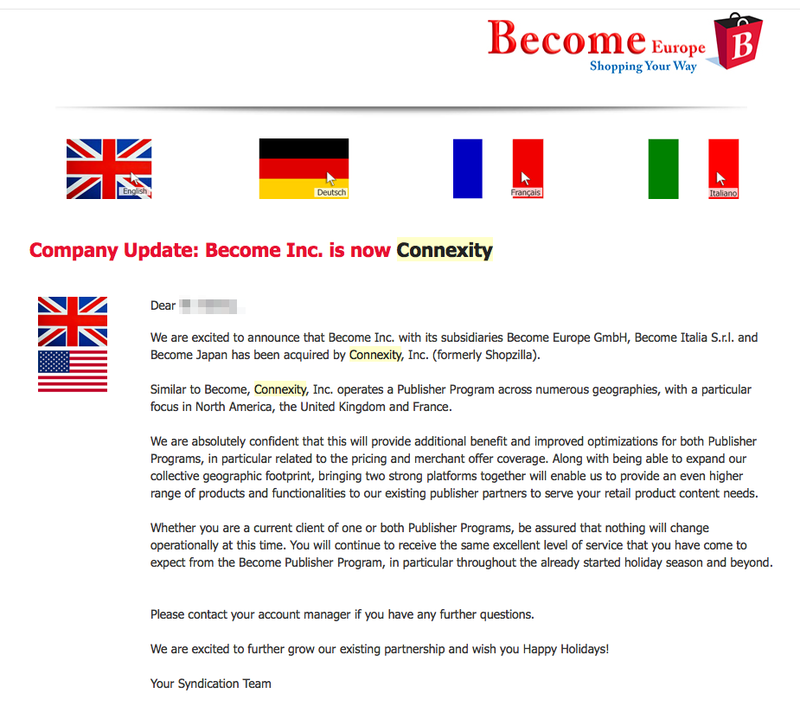 Before the Become.com acquisition, Connexity said it had a global audience of 50 million+ monthly users, counting traffic both on its affiliate network as well as its own websites. Significantly, that appears to be only 25 million more than the site had in 2010, a sign that it needs to do more to grow that business. To that end, Connexity has also made a string of acquisitions to build out more marketing tech, including buying the Connexity business in February 2014. So, while it continues to grow its price aggregation footprint, it is also trying to make a shift to selling more of that marketing tech to retailers to use on their own sites. Memo of the sale below. Updated with more comment from company and more background/history about the businesses.